Rockstar has just taken the wraps off GTA Online featuring the world of GTA 5 combined with 16 other players online and a persistently changing world which will live even when you're offline. Thanks to the 'always on' nature of Los Santos in GTA Online players will be able to jump into this version of the city at any time even when other players aren't online. In a unique twist players will find that once GTA Online goes live their character wheel will actually show a fourth option and this will be GTA Online letting you quite literally jump into online gameplay. Once inside you'll be able to customise your appearance and even own your own apartment within the city and yes, that includes the penthouse in the GTA 5 trailer. You can engage in both pre-determined and custom-built missions, however if you prefer to work as a team you can create crews which can then work together within Los Santos to rob banks, or jewelry stores. Not keen with the crew you've joined? Defection is always on the card leading you to cause some treachery based mayhem before disappearing off to a new crew. All of your actions within GTA Online are rewarded with money and reputation points, these then unlock more activites, vehicles and weapons within the game. Of course if taking on humans is more your thing then Rockstar have promised a myriad of crew vs crew opportunities letting you battle it out against other players. In a move that will infuriate some Rockstar have confirmed that GTA Online won't actually go live until two weeks after the launch of GTA 5, this is presumably to give players the opportunity to explore the already enormous single-player campaign and get to grips with the game mechanics. 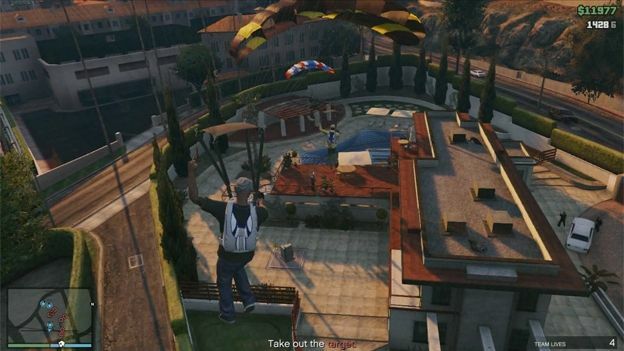 GTA Online will be launching on October 1st and will be completely free with every copy of GTA V.